Regulate. To fix, establish, or control; to adjust by rule, method, or established mode; to direct by rule or restriction; to subject to governing principles or laws. Denounce. To declare (an act or thing) to be a crime and prescribe a punishment for it. To pronounce or condemn something as being evil or morally wrong. From Black's Law Dictionary, 5th edition, (1979). Using popular legal texts such as a Black's Law Dictionary, my work questions the ways that law constructs the body. Studying the ways that bodies become subjects and objects of legal regulation, I am interested in how the body comes into language, or law, and how our definitions make sense to us? Who's body stands as "thee" body in the law, what kind of body is described in legal discourse, when is it property and how is it punished? My research and artwork has recently dealt with the relationship between science, medicine and the body. I have examined how science views the body, if science can yield a final truth, or, if science's objectifying effects obliterate and abandon other truths; subjective, social and emotional. In this recent installation I have experimented with combining the language of sculpture with the language of science. Peering through the large circular hole cut-out of a legal dictionary, the viewer is allowed to see-through the legal text and into a large water-filled glass vessel which serves as the underbelly / underworld to the authoritative "truths" located in the dictionary. 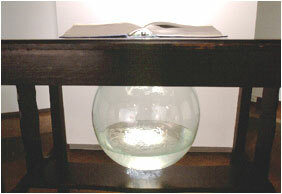 In this space below, viewers are presented with legal definitions not in their authoritative place, but rather, as suspended, floating fragments of text. Here, the pieces of text, like fragments of meaning, are unmoored from their disciplinary context and sent adrift. The meanings of the law are shown in this installation as being unstable and fluid, yet also having the potential to enact disciplinary effects on the body. Pinned onto the wall and gathered into individual test tubes are suspended yet sinking dictionary definitions of individual body parts and organs. These objects cast animated shadows like those of the body's internal organs. My intent within the wider aims of this project and associated conference on women and the law therefore, is to dialogue with those using legal language; to discuss the effects of choices over language. This study carries over into important legal and social areas and debates within medical science, such as abortion, DNA testing and cloning. As new visual technologies are currently making the human body into a virtual territory, new legal definitions of bodies and their parts are also being written. I am interested in how these visual and legal territories over-lap. In my work, I want to leave the viewer with a lingering set of questions, asking; what is our body's relationship to the law, who/what is in control, and what is our possible future? Cindy Stelmackowich's work reflects her long-standing interest in the body; how it becomes gendered, represented, or imagined. Born in Saskatchewan, Cindy has also lived in Ottawa and New York, where she has worked as an art critic, lecturer and curator. Her artwork is often in dialogue with the wider academic interests she pursues while completing a Ph.D. in the History and Theory of Art.